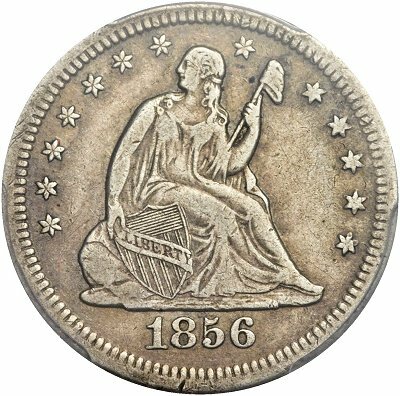 The Top 25 Liberty Seated Quarter Varieties were initially published in the Liberty Seated Collectors Club's Gobrecht Journal, Issue #111. Greg Johnson was the author and worked extensively with club colleagues toward the Top 25 Variety set formulation. Greg published a follow-on article in the March 2014 Gobrecht Journal Issue #119 concerning LSCC survey results for the Top 25 Varieties. Following is his Issue #119 article. 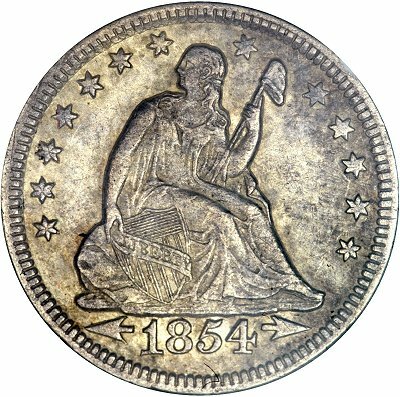 Gobrecht Journal Issue #111 (July 2011) featured an article introducing the “Top 25” Liberty Seated quarter varieties. The process of defining the set and specifics of each individual variety, including attribution points and rarity estimates, were detailed. Early in 2013 a survey form was mailed to all Liberty Seated Collectors Club (LSCC) members requesting information regarding individual club member holdings of these Top 25 varieties. A total of 53 club members reported owning 580 examples of the 25 varieties. Some important caveats should be kept in mind before considering the compiled survey data. First, the coins described here include only coins reported by LSCC members who responded to the survey. There are undoubtedly both non-members who have significant holdings and members who did not respond. Though interesting and useful information can be obtained, no survey can be considered complete or definitive. 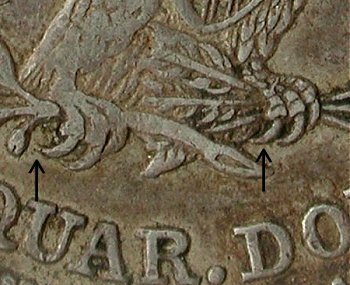 Second, long recognized, Redbook listed, and naked eye varieties are inherently more collected in comparison to recently discovered, unlisted and more visually subtle issues. Rarity comparisons based on survey results should take care to recognize these important distinctions. Third, data is presented differentiating certified and uncertified coins. Certified, for the purposes of this survey report, is defined as residing in a problem free PCGS or NGC holder. 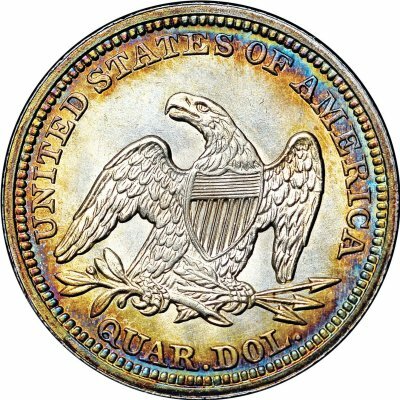 No SEGS, ANACS, ICG, or “details” holder coins are included as certified; they are reported as raw. 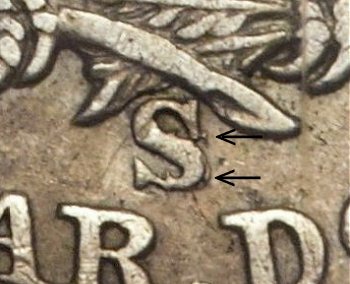 Finally, damaged coins (e.g. holed) are included in the survey, as they are attributable as examples of the variety in question. 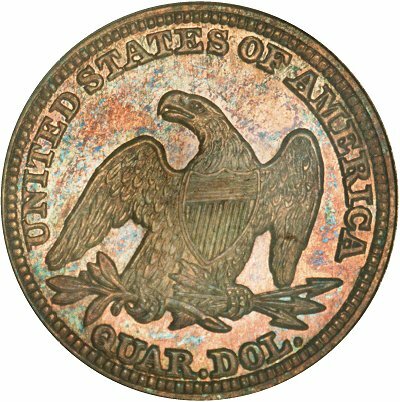 However, regardless of their details grade or overall state of preservation, they are included as raw coins grading AG-G in the tabulations. The overall summary of the coins reported in the survey is shown in Table 1. Individual collections varied considerably, with the largest collection including 71 examples of the Top 25 varieties, and the most complete collection containing at least one example of 23 of the 25 varieties. 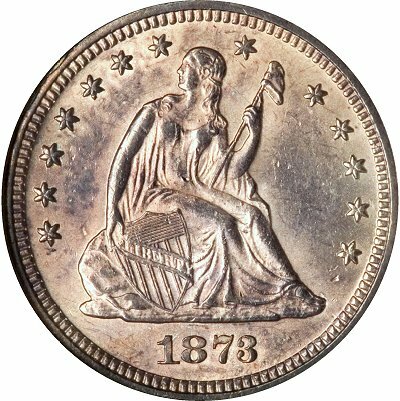 Raw coins represented 76% of the reported examples, with the remaining 24% certified by PCGS (17%) and NGC (7%). There were a number of significant accumulations of a single variety, which will be pointed out with respect to each individual variety. 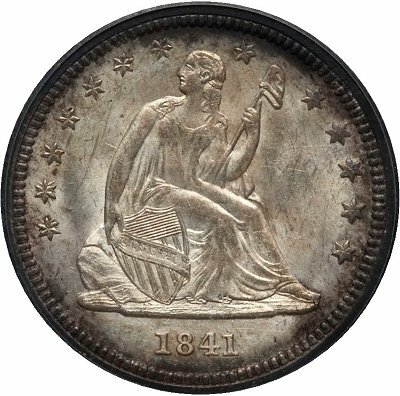 One collection of note contained 21 certified pieces and included 16 of the 37 mint state coins reported in the survey. Only 3 of the 53 collections contained 20 or more of the 25 varieties; 3 more included 15-19 different varieties; 10 collectors reported 10-14 varieties; 5-9 varieties were in 14 collections; and 23 collectors had 4 or fewer of the Top 25 varieties. 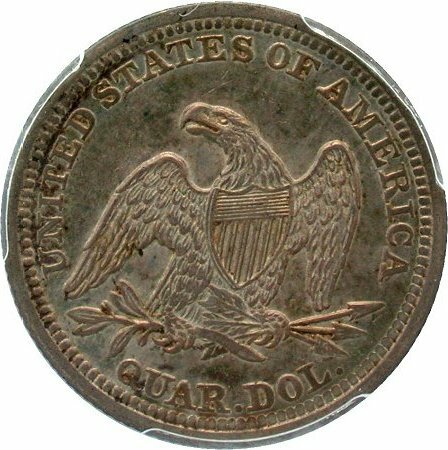 Likewise with total coins, 2 collectors owned more than 50 individual examples of the Top 25 varieties; 3 owned 25-49; 15 owned 10-24 coins; and 33 owned fewer than 10 total examples of the Top 25 varieties. 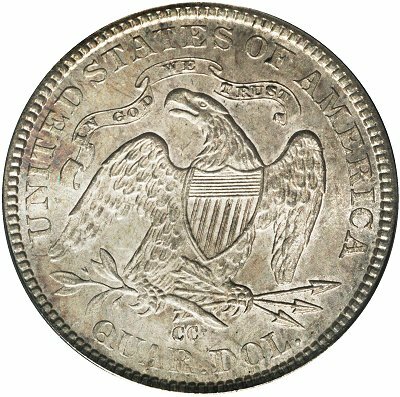 Analysis of the data included ranking the 25 issues by total number of coins reported, average grade, number of the 53 collections having at least one example, and percentage of specimens certified by NGC or PCGS. 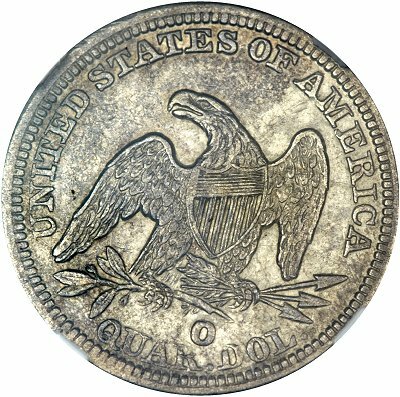 It is interesting to note how individual coins change places depending on the ranking criterion, illustrating that some of the varieties are almost always found in low grades, tend not to be certified, and are particularly prone to accumulation of multiple examples within a single collection. Rarity: A rarity estimate for all grades and conditions combined is made using the R-scale (R1 = >1000, R2 = 501 – 1000, R3 = 251 – 500, R4 = 76 – 250, and R5 = 31 – 75). 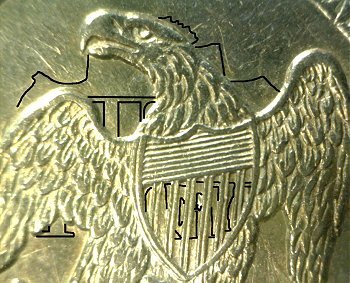 Survey: The number of examples reported in the 1993 and 2007 Liberty Seated Collectors Club surveys are noted, along with the current (2013) number reported and the variety’s rank (1 of 25 being the least reported). Condition: The calculated average grade and the variety’s rank in terms of average grade is presented (1 of 25 being the lowest average grade). 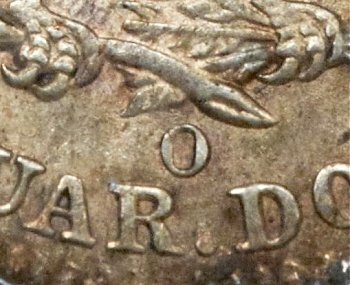 The grade and certification of the finest known example of the variety is also noted. 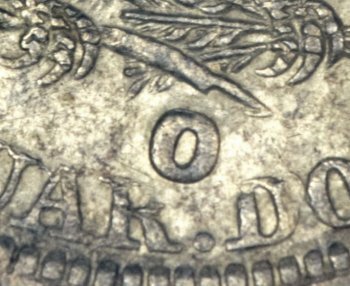 Note that the average grade calculation is necessarily crude; all AU coins are considered to have a numerical grade of 55 and all mint state coins a grade of 63, etcetera, for the purposes of the calculation. 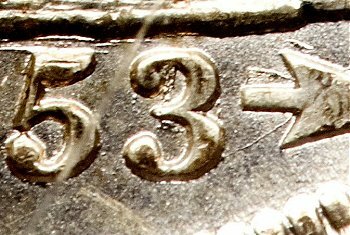 Collections: The number of collectors having at least one example and the variety’s rank based on that criterion are given (1 of 25 being the coin appearing in the fewest collections). The total number of examples reported is divided by the number of collections in which they appear to give the average number of examples per collection. Accumulations: Accumulations of 3 or more coins are noted. For example, if three collectors each report having 3 examples of a variety, and a fourth collector has 5, it will be noted as: 3,3,3,5. 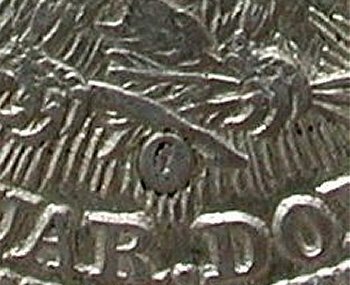 Certification: The percentage of reported examples certified as problem free by PCGS and NGC is given along with the variety’s rank based on that criterion (1 of 25 representing the coin with the lowest percentage of certified examples). 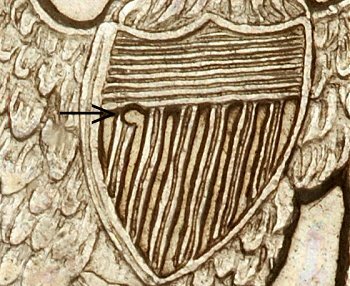 PCGS Coin #: If PCGS has assigned the coin a number, either as a major variety with a regular issue coin number or as a variety recognized by their attribution service, that number is noted and certification information is summarized. Comments: Additional information regarding history of the variety, availability in the marketplace, or thoughts that might put the survey findings in context is provided. Collections: Appears in 14 of 53 collections (Rank 13 of 25): 1.21 coins per collection (17 coins in 14 collections). Certification: 5.9% certified (Rank 2 of 25). Collections: Appears in 14 of 53 collections (Rank 13 of 25): 1.36 coins per collection (19 coins in 14 collections). Certification: 31.6% certified (Rank 21 of 25). 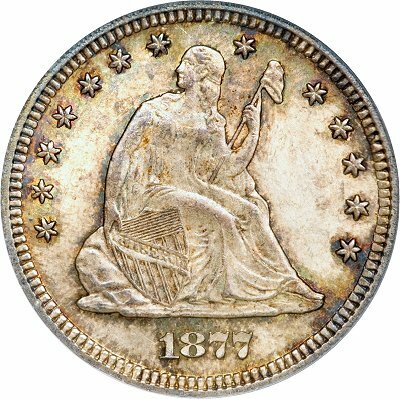 PCGS Coin #395925. 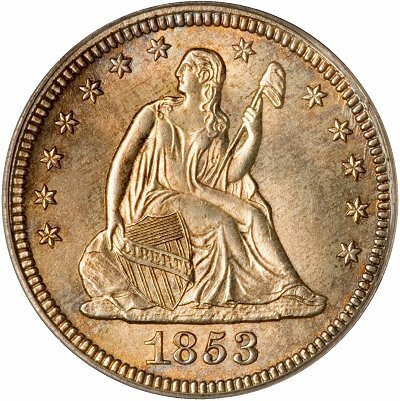 Four coins attributed by PCGS as of 5/1/13 – F12, F15, VF35 and MS63. 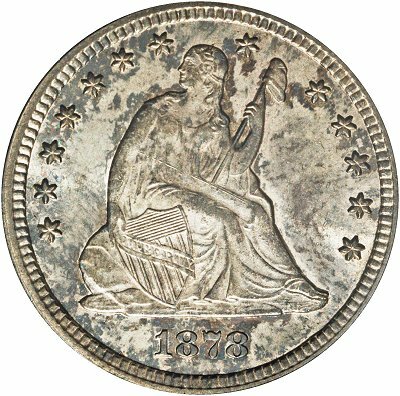 Comments: The 1840 – O With Drapery Large O quarter is an important transitional coin that the LSCC membership voted number 7 on the list of greatest New Orleans seated coins. 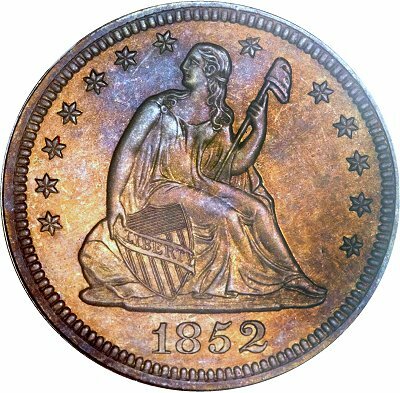 It is rare, quite well known among Liberty Seated collectors, easy to attribute, highly sought after, and highly priced. 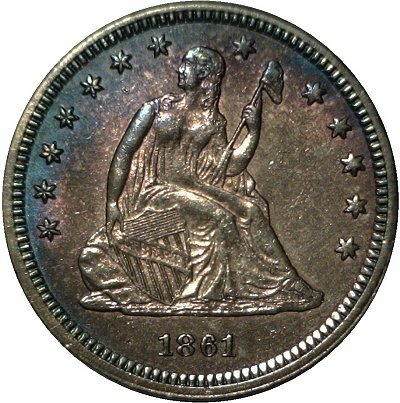 Larry Briggs, in The Comprehensive Encyclopedia of United States Liberty Seated Quarters, called this issue the “rarest collectible seated quarter.” At the time (1991), there were 16 verified examples in all grades. Current estimates place the total number at about 40 in all grades combined. Most known examples are in VG or lower condition and/or have significant problems. There are two MS63 examples known and one AU. Collections: Appears in 20 of 53 collections (Rank 18 of 25): 1.1 coins per collection (22 coins in 20 collections). Certification: 27.3% certified (Rank 20 of 25). 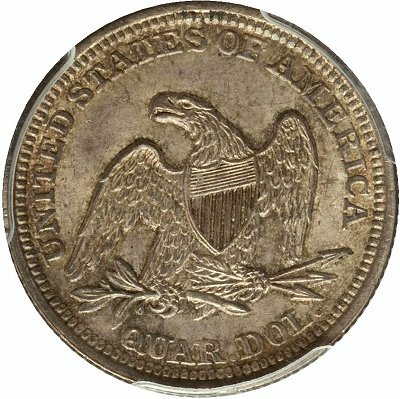 Comments: The 1841 – O Doubled Die Obverse (DDO) is common for a seated quarter variety, with an estimated 200+ pieces from the New Orleans hoard alone. 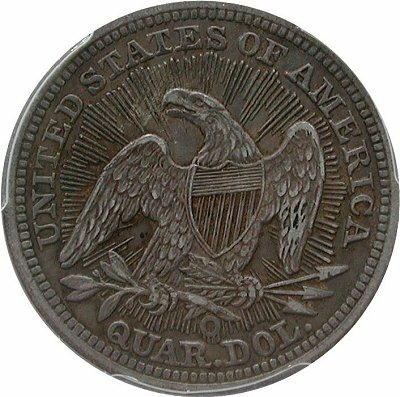 The majority of 1841-O quarters available in the marketplace are the DDO variety. Despite this availability there were not large numbers of examples reported in the survey. Many of the known examples have problems as a result of being in the ground for many decades. 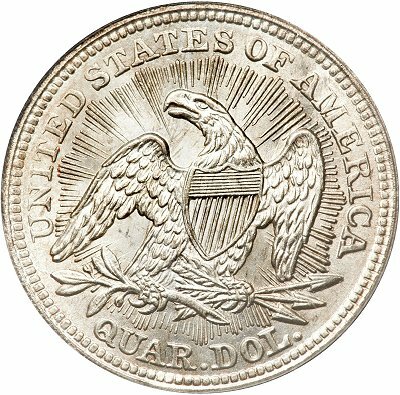 A number of examples exist in almost uncirculated and lower mint state grades, as reflected in the current survey. Collections: Appears in 24 of 53 collections (Rank 21 of 25): 1.33 coins per collection (32 coins in 24 collections). Certification: 34.4% certified (Rank 22 of 25). 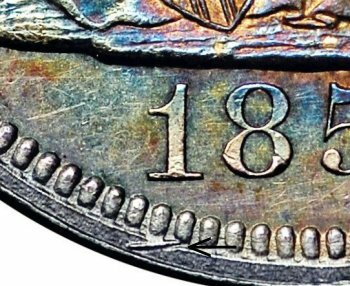 Comments: The 1842-O Small Date has long been recognized as a major variety, rare in all grades, and is listed in all major catalogs and price guides. 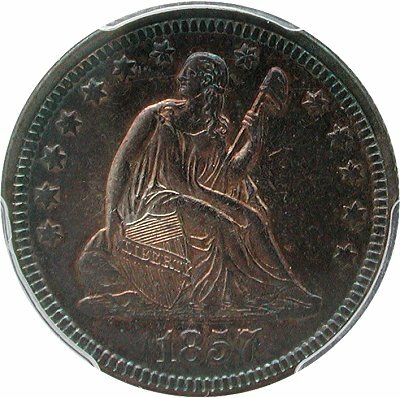 During 2007-2008 the LSCC membership voted it number 6 on the list of greatest New Orleans seated coins. 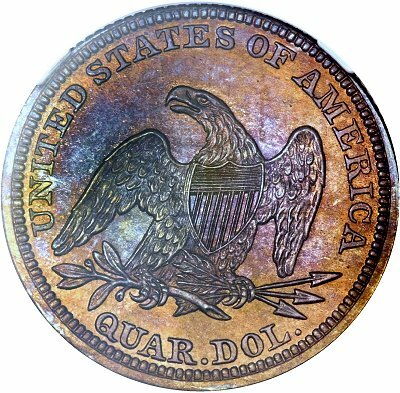 As an established and sought after variety, a higher than typical percentage of extant examples are in club member’s collections, and are encapsulated by third party grading services. Collections: Appears in 28 of 53 collections (Rank 25 of 25): 1.71 coins per collection (48 coins in 28 collections). Certification: 22.9% certified (Rank 16 of 25). 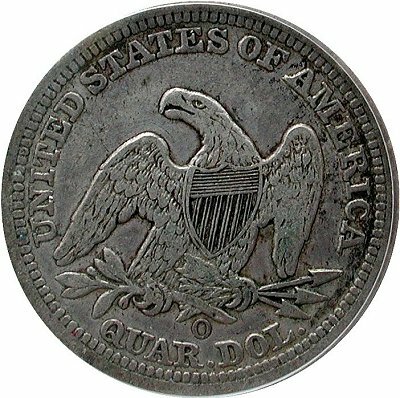 Comments: The 1843 – O Large O had the most examples reported and appeared in the largest number of collections (28 of 53) of any of the Top 25 varieties. It has long been recognized as a major variety, is easy to attribute, and is listed in all major catalogs and price guides. 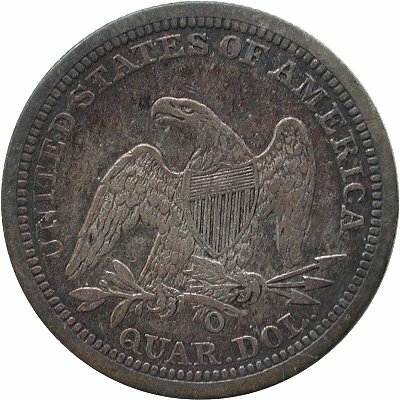 The 1843-O Large O is typically found in low grades (as indicated in the survey results) and becomes very rare in XF or better. 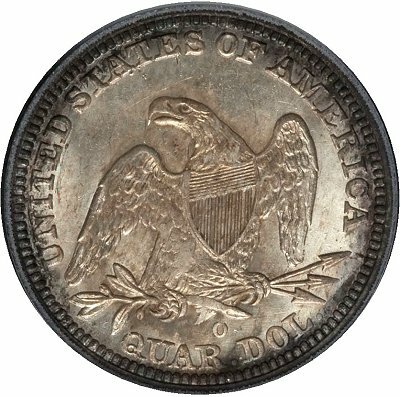 The single known uncirculated specimen is the Eliasberg coin (Bowers 4/1997:1434: MS-65, raw: $14,300) now in an NGC MS64 holder. It sold at FUN this January (Heritage 1/2013:5594) for $25,850, is owned by an LSCC member, and is included in this survey. Collections: Appears in 10 of 53 collections (Rank 8 of 25): 2.6 coins per collection (26 coins in 10 collections). Certification: 15.4% certified (Rank 6 of 25). 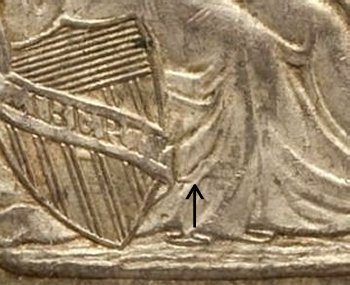 Comments: This variety is rare and seems to occur in about equal numbers with rotated and non-rotated dies. 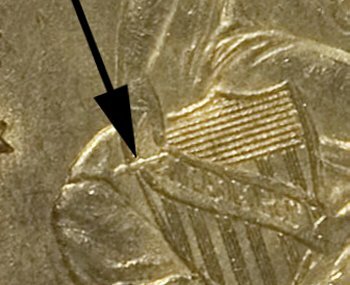 Reports from collectors indicate that the rotated (medal turn) coins are more prevalent, but it is likely that the ease of attribution of the rotated version makes them seem more common than they are relative to the more-difficult-to-attribute coins with normal alignment. As indicated by the survey results, this variety is very rare in grades of fine or better. No examples grading better than XF have been found to date. Collections: Appears in 12 of 53 collections (Rank 10 of 25): 1.5 coins per collection (18 coins in 12 collections). Certification: 22.2% certified (Rank 14 of 25). 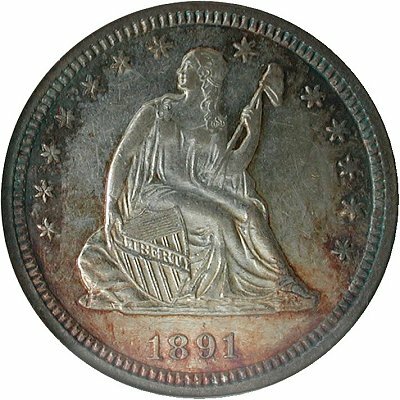 PCGS Coin #395923. Six coins attributed by PCGS as of 5/1/13 – VF35, XF40, XF45, AU53, and MS63 (2). Comments: The variety appears to be available with patience but it seems unlikely that more than 50 - 60 examples exist. It can be found in all grades – roughly in equal proportion to the other die marriages of the date. 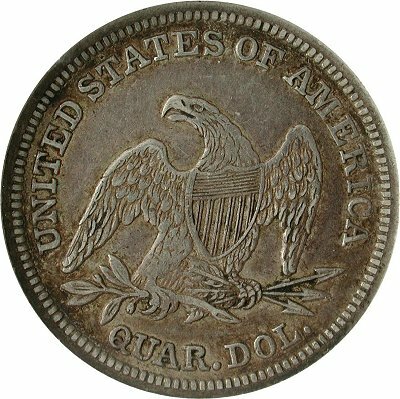 At least three mint state coins and a few AU examples are known. Collections: Appears in 22 of 53 collections (Rank 20 of 25): 1.18 coins per collection (26 coins in 22 collections). Certification: 26.9% certified (Rank 19 of 25). 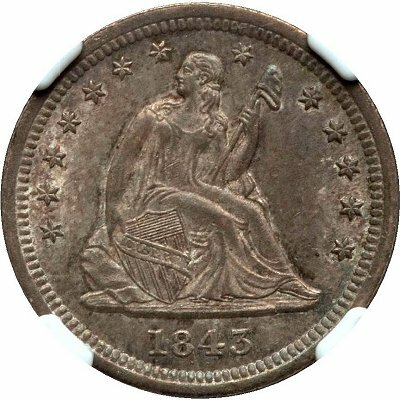 Comments: The 1848 is a very scarce coin that becomes rare in high grades. 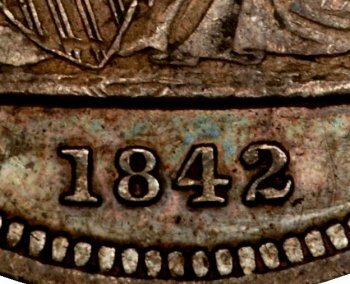 The 1848/1848 is harder to find than the other 1848 (tripled date) die marriage. Generally well-struck and available in all grades except mint state. Rarity increases with grade. Collections: Appears in 15 of 53 collections (Rank 15 of 25): 1.33 coins per collection (20 coins in 15 collections). Certification: 50% certified (Rank 24 of 25). 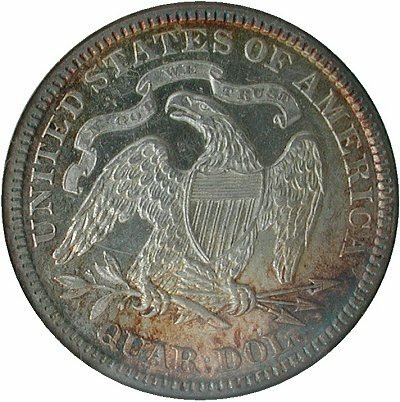 Comments: The 1850 is a very scarce date, with the 1 on rim variety about twice as rare as the other 1850 die pair (without the 1 on the rim). 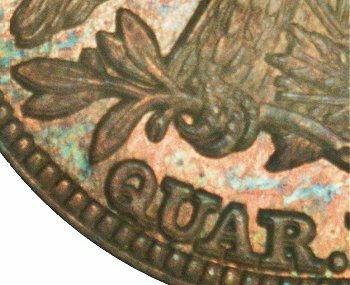 The variety is well struck, as are all of the Philadelphia quarters of the year. Rarity increases with grade. Collections: Appears in 8 of 53 collections (Rank 6 of 25): 1.38 coins per collection (11 coins in 8 collections). Certification: 18.2% certified (Rank 8 of 25). 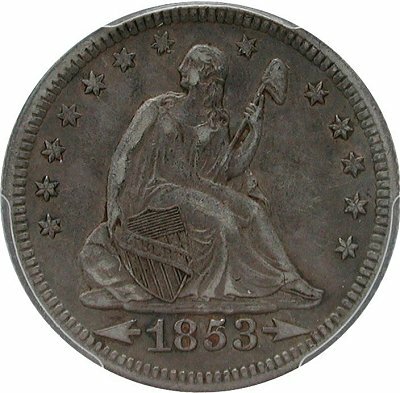 Comments: The 1852/52 die marriage represents less than 10% of all 1852 quarters. There appear to be more high-grade examples than one would expect based on overall rarity. 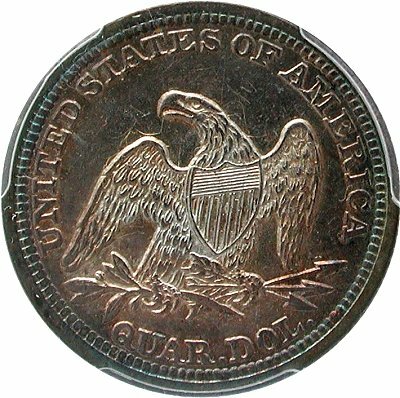 Three mint state examples of the variety (not counting proofs) have been seen. 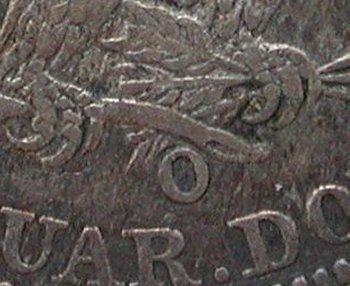 This is true of both die pairs for the date and is undoubtedly due to melting of circulating coins following the weight change in 1853. Average to strong strikes are the rule for 1852 quarters of both die marriages. 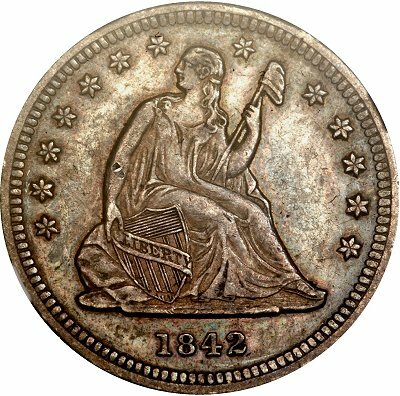 Collections: Appears in 19 of 53 collections (Rank 17 of 25): 1.21 coins per collection (23 coins in 19 collections). Certification: 52.2% certified (Rank 25 of 25). 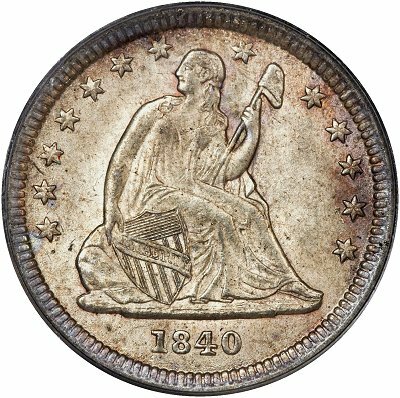 Comments: The 1853 No Arrows is a long-recognized and popular rarity in the seated quarter series. 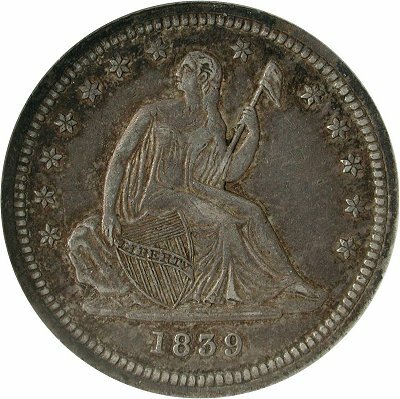 During 2008 the LSCC membership voted it number 8 on the list of greatest Philadelphia seated coins. 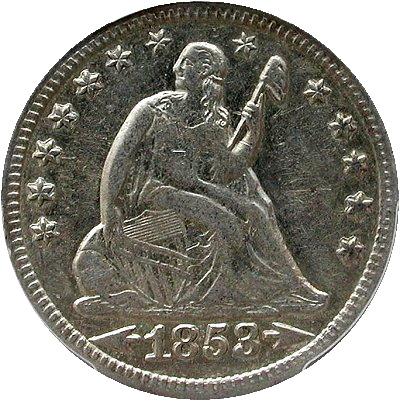 The grade profile of the 1853 No Arrows is very unusual for a seated coin. 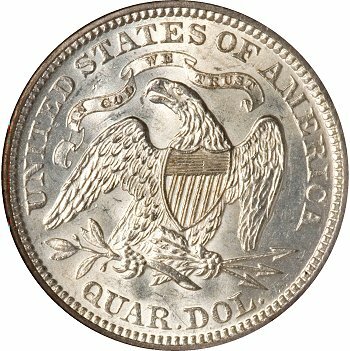 There may be more uncirculated examples than VF’s; XF and better examples are far more available than lower grade pieces. Collections: Appears in 26 of 53 collections (Rank 23 of 25): 1.38 coins per collection (36 coins in 26 collections). Certification: 25% certified (Rank 17 of 25). 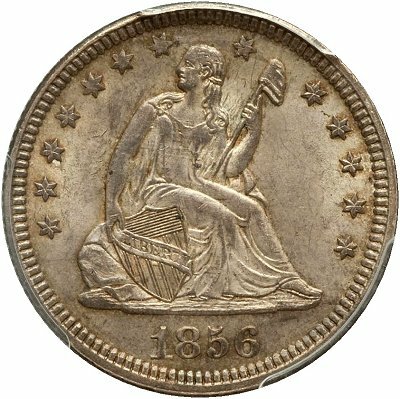 Comments: The 1853/4 is a common, readily available coin that is listed in major catalogs and price guides. Collections: Appears in 11 of 53 collections (Rank 9 of 25): 3.18 coins per collection (35 coins in 11 collections). Certification: 2.9% certified (Rank 1 of 25). Collections: Appears in 6 of 53 collections (Rank 1 of 25): 1.83 coins per collection (11 coins in 6 collections). Certification: 18.2% certified (Rank 9 of 25). Comments: The variety is rare. It is, however, likely that a number of lower grade examples remain unattributed and can be found with enough searching. 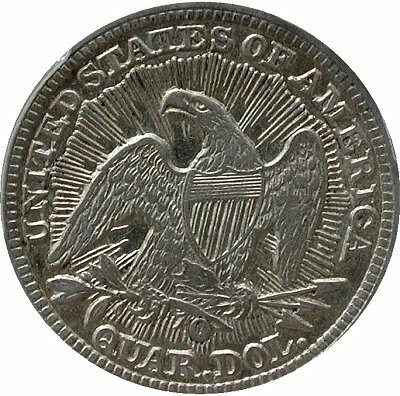 No uncirculated specimens are known, but at least two certified AU examples exist. Any example in XF or better is very rare. Collections: Appears in 26 of 53 collections (Rank 23 of 25): 1.23 coins per collection (32 coins in 26 collections). Accumulations: Two collectors report 3 examples each. Certification: 22.6% certified (Rank 15 of 25). 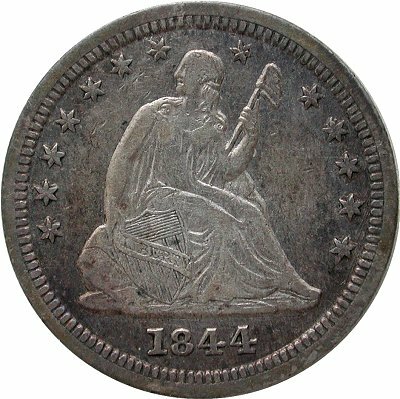 PCGS Coin #5434. 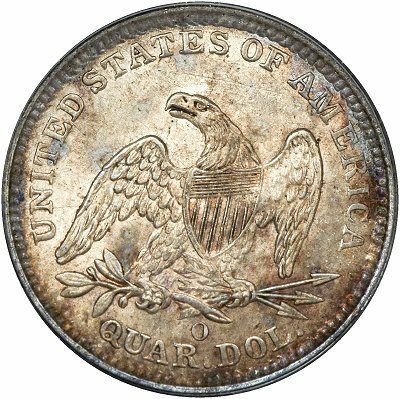 PCGS has graded 67 examples; none in mint state and only two above XF. 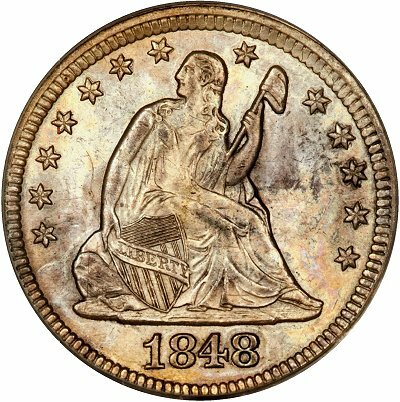 Comments: The 1854-O Huge O is, at current price levels, continuously available in the market place. 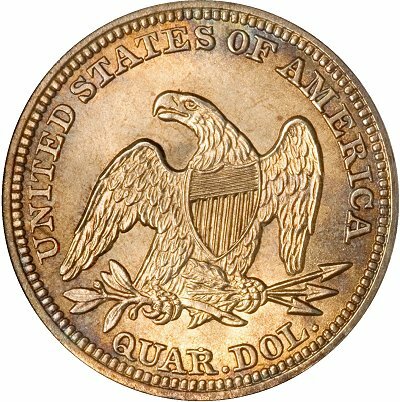 It is unknown in mint state and quite rare in XF and better. Collections: Appears in 13 of 53 collections (Rank 11 of 25): 2.46 coins per collection (32 coins in 13 collections). Certification: 21.2% certified (Rank 12 of 25). 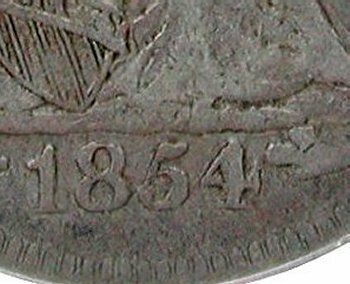 Comments: The 1854-O Crumbled Obverse is the biggest surprise of the survey. A total of 3 examples were reported in the 1993 LSCC survey, increasing only to 4 in 2007, but that number has now soared to 32. 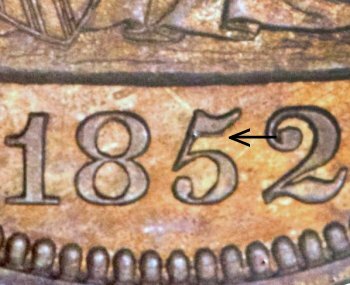 Exactly the same number of 1854-O Huge O and Crumbled Obverse coins were reported. 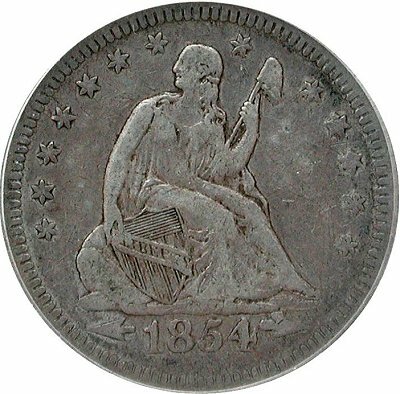 However, multiple examples of the 1854-O Huge O can be found for sale at any large show or on the internet at any time, whereas obtaining an example of the 1854-O Crumbled Obverse requires great patience and luck. Examples in any condition appear only a few times a year. Collections: Appears in 6 of 53 collections (Rank 1 of 25): 2.33 coins per collection (14 coins in 6 collections). Certification: 7.1% certified (Rank 3 of 25). 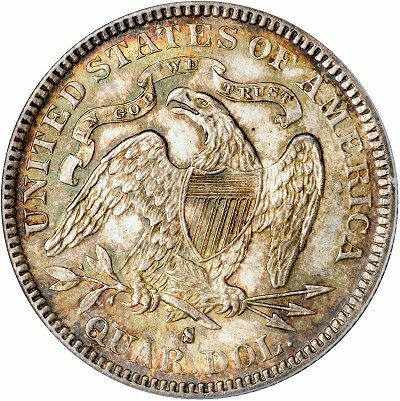 PCGS Coin #395934. 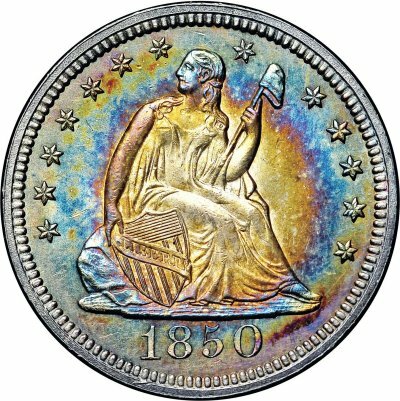 PCGS has attributed three examples: VF35, XF40 and MS64. Comments: The variety does not appear to be rare, though it can be challenging to find a nice, original example. It is underreported in this survey because it is a recent discovery that is not yet widely sought. 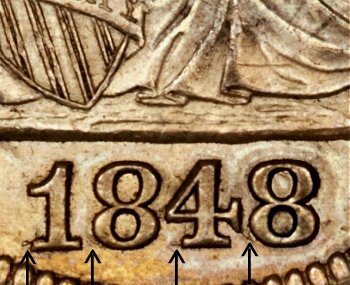 Despite its recent discovery, PCGS has assigned it a variety number (395934) and has begun certification of examples in slabs bearing this number. It is available in all grades but much more difficult in AU and MS than in lower grades. At least two certified examples in MS64 are known (though they are not both attributed). Collections: Appears in 17 of 53 collections (Rank 16 of 25): 1.35 coins per collection (23 coins in 17 collections). Certification: 26.1% certified (Rank 18 of 25). Collections: Appears in 7 of 53 collections (Rank 5 of 25): 1.71 coins per collection (12 coins in 7 collections). Certification: 16.7% certified (Rank 7 of 25). Comments: The 1857 Smoking Liberty variety is a quite recent discovery (not listed in Briggs’) and is rare. 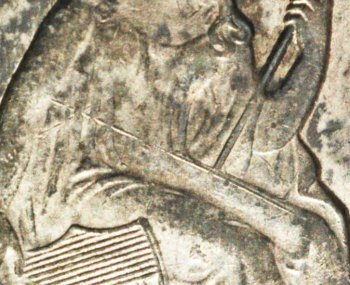 There were claims in 2009 of a hoard of 28 pieces (David Lawrence Rare Coins) and though examples appear in the market periodically, the 12 reported here still lead to an estimate of less than 100 pieces in all grades. 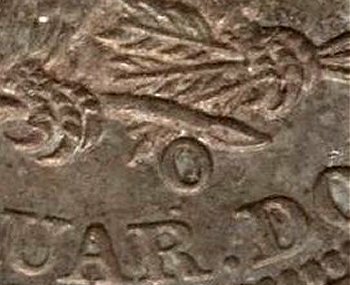 At least two mint state specimens are known, the finest being a PCGS MS64. It appears that the variety exists in all grades. Collections: Appears in 6 of 53 collections (Rank 1 of 25): 2.5 coins per collection (15 coins in 6 collections). Certification: 20% certified (Rank 11 of 25). Comments: Though the current survey seems to indicated the variety is very rare, it can be challenging to attribute and very easy to overlook with a naked eye examination or even a cursory inspection using a glass. 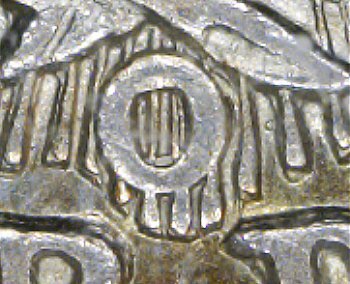 It can be very difficult to attribute low-grade coins, which may account for the majority of known pieces having VF or better details. 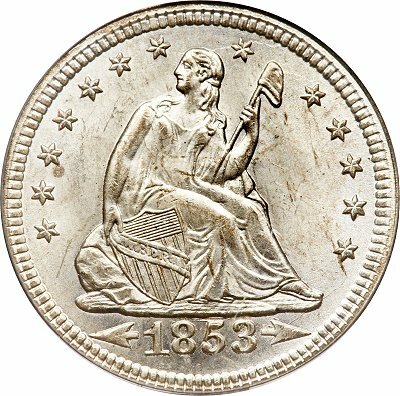 Collections: Appears in 8 of 53 collections (Rank 6 of 25): 2.5 coins per collection (20 coins in 8 collections). Certification: 15% certified (Rank 5 of 25). 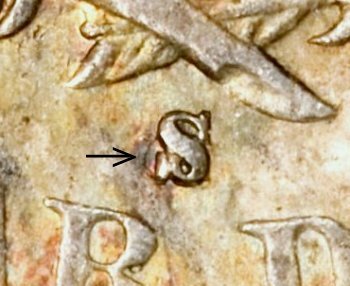 Comments: The Type II/I mule is a very rare coin. 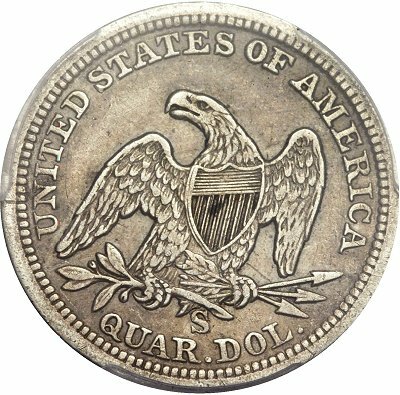 Estimates put the number of examples below 0.5% of the total population of 1861 quarters. 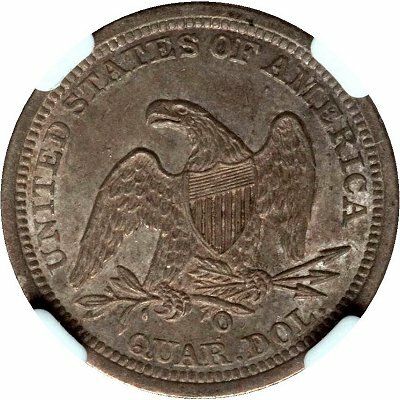 Although no mint state examples are known, the variety appears in all circulated grades, roughly in proportion to the other existing die marriages for the issue. Collections: Appears in 21 of 53 collections (Rank 19 of 25): 1.33 coins per collection (28 coins in 21 collections). Certification: 21.4% certified (Rank 13 of 25). 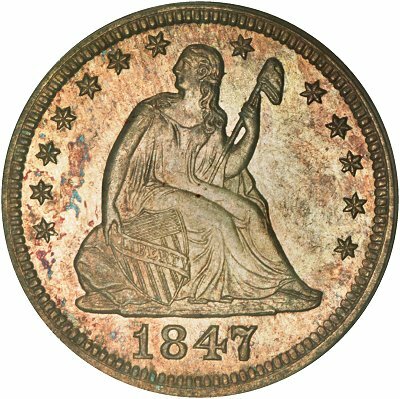 PCGS Coin #5484. 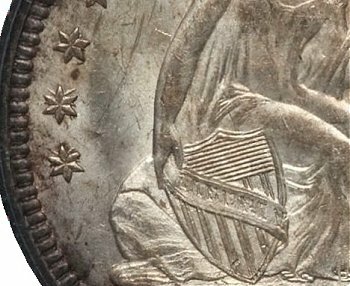 PCGS has certified 33 examples, including two in mint state and 6 in AU. Comments: Most specimens are in low grade and/or have problems. The variety becomes very rare in XF and better. Collections: Appears in 24 of 53 collections (Rank 21 of 25): 1.38 coins per collection (33 coins in 24 collections). Certification: 39.4% certified (Rank 23 of 25). 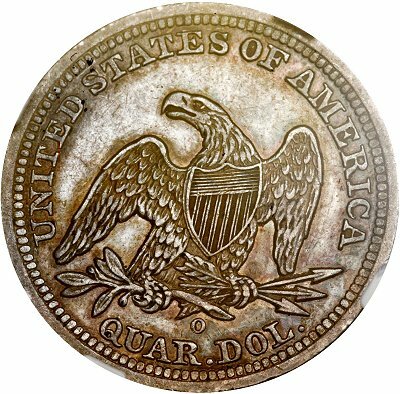 Comments: The variety is quite common and readily available in all grades, including mint state. Collections: Appears in 13 of 53 collections (Rank 11 of 25): 1.23 coins per collection (16 coins in 13 collections). Certification: 18.8% certified (Rank 10 of 25). 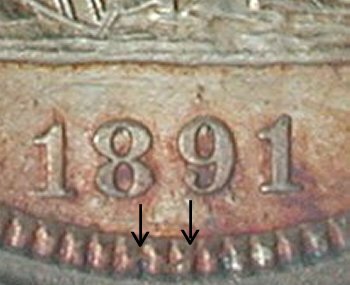 Comments: This is an interesting and unique issue in which the obverse die was defaced prior to being used to strike coins. It has been suggested that “cancelled die” is really a misnomer as truly cancelled dies have much more extensive damage. 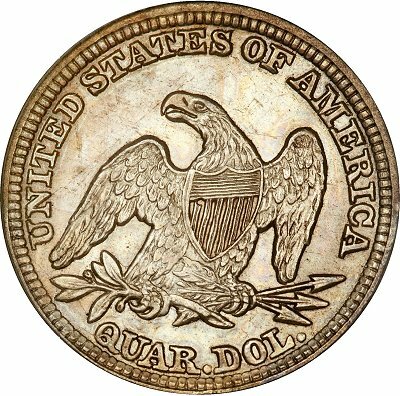 However, a very lightly cancelled Morgan dollar die was recently seen at the New Orleans mint and appears to lend support to the idea that this variety is actually from a cancelled die. 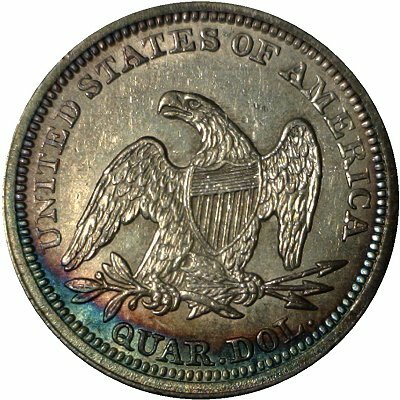 The variety is not as continuously available as the 1877 -S/Horizontal S, but is available in all grades with patience. Generally well struck, but from heavily rusted dies. High-grade specimens tend to be proof-like. Certification: 9.1% certified (Rank 4 of 25). Comments: Though rare, the pieces that do exist appear to include most grades.